The proclamation, on 14th April 1931, of the Catalan Republic, transformed shortly afterwards into the Generalitat of Catalonia, opened a period of constitutional reform in the Principality on which the juridical structure of the new Catalan autonomy within the Second Spanish Republic was built. 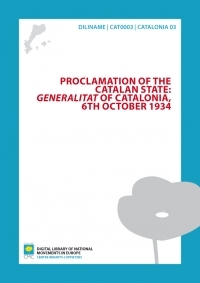 In September 1932, the Statute of Catalonia was approved and in November the Parliament of Catalonia was elected. The Catalan party, Esquerra Republicana, a group representing the popular classes, was consolidated as a leading party. Elections in November 1933 resulted in a swing towards conservatism in the Spanish Parliament. As a consequence, the centre-right (which was openly hostile to the devolved autonomy model and the demands of the popular classes) gained access to centralised power. This led to a conflict between the Catalan and Spanish governments. For some time now, monarchist and fascist forces have been awaiting an opportunity to betray the Republic. They have now achieved their objective and have seized power. The parties and men who have publicly demonstrated against the longed for liberties of our land, along with the political centre which has constantly preached hate and war towards Catalonia, today make up the backbone of support for current institutions. Recent events have given all citizens the manifest feeling that the Republic, in its fundamental democratic form, is in the gravest danger. All of the authentically Republican forces of Spain and its more advanced social sectors, without distinction or exception, have taken up arms against this brazen fascist takeover. A Liberal, Democratic and Republican Catalonia cannot be absent from the protest that is triumphing all over the country; nor can it silence its declarations of solidarity towards our brothers who, throughout Hispanic lands, are fighting to the death for Liberty and Right. Catalonia has hoisted its flag! We call on everyone to do their duty and give their unswerving loyalty to the government of the Generalitat, which, from this moment, breaks off all relations with these deceitful institutions. In this solemn hour, in the name of the people and of Parliament, the government over which I preside has taken over all the faculties of power in Catalonia and proclaimed the CATALAN STATE within the federal Spanish Republic. In order to establish and fortify our relationship with the leaders of the general protest against fascism, we invite them to establish in Catalonia the Provisional Government of the Republic. They will find that we Catalans will demonstrate the most generous fraternity in our common aim of building a Federal Republic that is free and magnificent. The Government of Catalonia will be in constant touch with the people. We will establish in Catalonia an indestructible stronghold fortified by the true spirit of the Republic. We encourage all Catalans to obey the Government and require that no one ignores its orders. With the enthusiasm and discipline of the people, we feel strengthened and invincible. We will keep everyone in line, but it is essential that each one of you maintain calm and subject yourself to the discipline and instructions of your leaders. From this moment on, the government will work ceaselessly to ensure that nobody disrupts, or compromises, our patriotic objectives. Catalans: the hour is grave and glorious. The spirit of President Macià, the restorer of the Generalitat, is with us. Everyone to your stations and keep Catalonia and the Republic in all of your hearts. Long live the Republic and long live Liberty! Lluís Companys, President of the Generalitat of Catalonia – Joan Casanovas, President of Parliament. Councillors: Joan Lluhí i Vallescà, Josep Dencàs i Puigdollers, Martí Esteve i Guau, Ventura Gassol i Rovira, Joan Comorera i Soler, Martí Barrera i Maresma and Pere Mestres i Albet.